The Oscars are upon us once again, with all the glitz, glamour and star studded splendor that is Hollywood. Gorgeous gowns and glittering gems adorn both sophisticated stars and wistful wannabes as they saunter and sashay along the red carpet into the Dolby Theatre. No big deal, you say? Hmmmmm. Where else can you find an audience of 40 million viewers? Regardless of the good, the bad, and all that goes with “box office” and “bottom line,” it’s still the place where dreams are born, and where we, as viewers, can escape into a world where anything is possible. 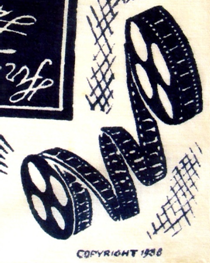 We cheer for those artists who transcend the limits of a two dimensional screen to breathe life and blood into stories that enthrall and enchant, engross and entertain, and possibly even change the course of our thinking. A great movie is Hollywood at its finest, and we all want to be along for the ride. Of course we all wish that we stand side by side with Hollywoods finest and the closes we could get to might be enjoying a vacation in LA while staying somewhere like this StayTony Beverly Hills Suites and living like celeb royality for a few days. 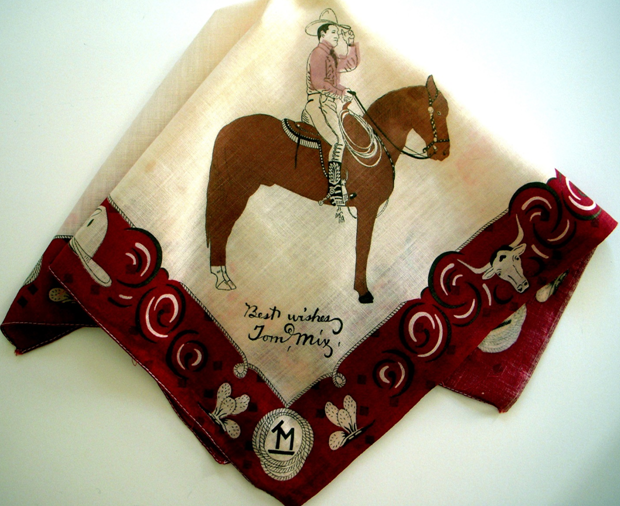 Here’s a handkerchief that exemplifies old Hollywood – the sparkle and sizzle, the hoopla and ballyhoo of stardom. 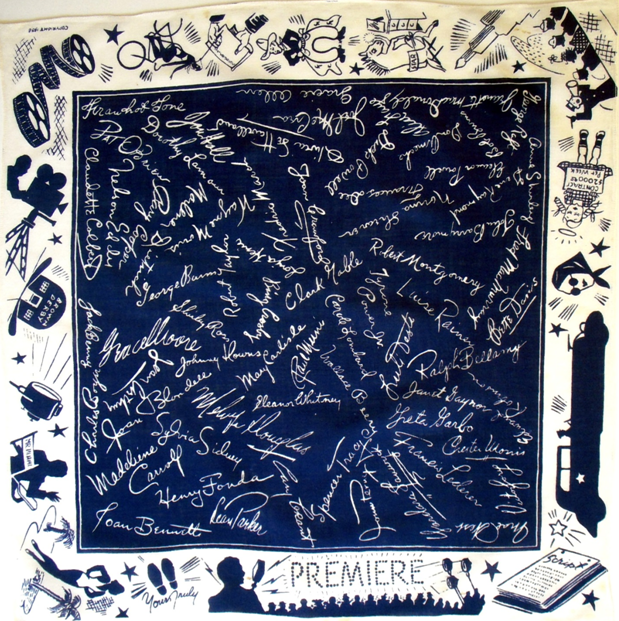 Autographs of the rich and famous swirl and dance like stars in the heavens against a navy backdrop, while the border tells the story of movie studios in their heyday. It’s all here, from the stretch limo reminiscent of Gloria Swanson in Sunset Boulevard, to lunch at the Brown Derby to double decker bus tours of the star’s mansions. 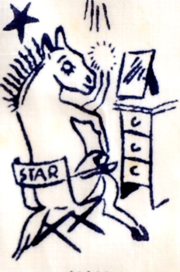 as confirmed by Tom Mix’s horse Tony, and Hopalong Cassidy’s steed, Topper. 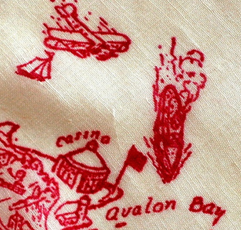 Isn’t this a grand souvenir handkerchief for a young boy to have? It’s in excellent condition, so I’m sure it was treasured. 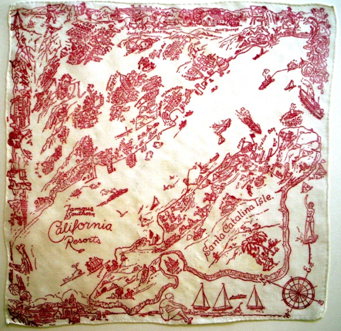 Practically any handkerchief that featured California included a tip of the hat to Hollywood. This example, bordered by golden poppies, the state flower, and sun ripened oranges includes the requisite swoon into the arms of Mr. Wonderful. 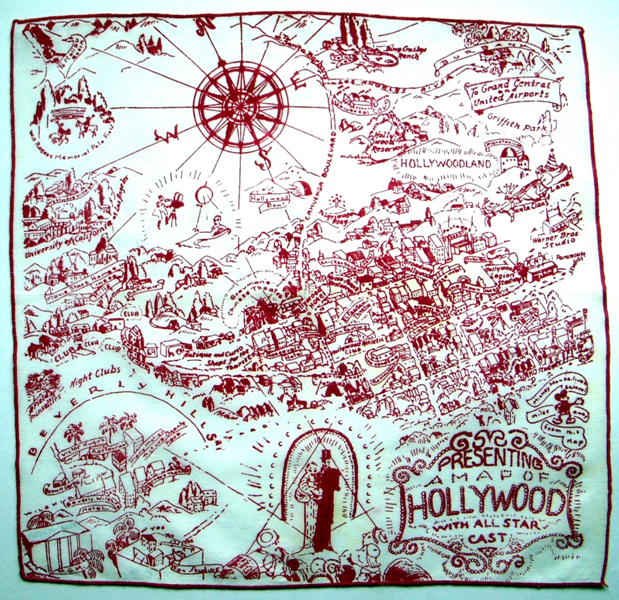 This handkerchief attempts to include every possible landmark a tourist should or could visit, all bursting forth like a fireworks display from the strong diagonal that is Hollywood Boulevard. Wow. It will definitely require some time to take it all in. What’s with the Famous Spot in the SE corner? What a hoot. 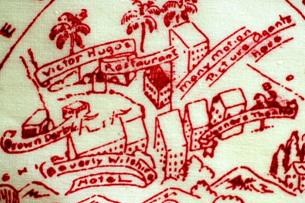 This bird’s eye view Hollywood in its heyday has it all. 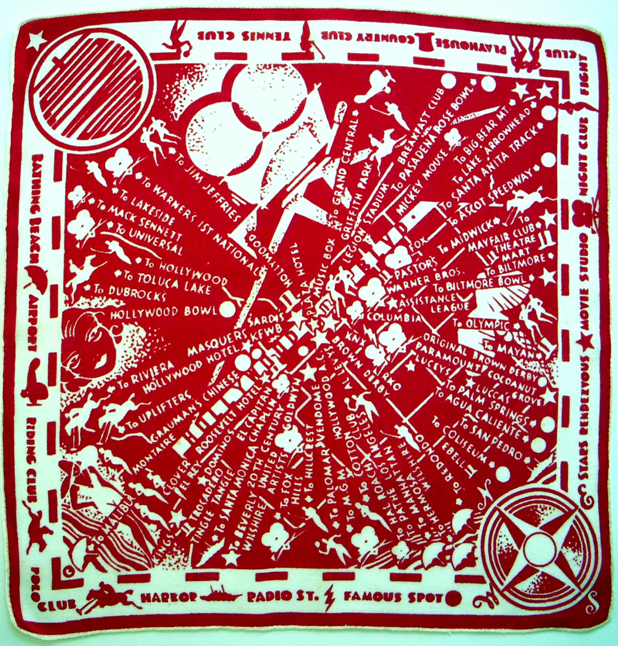 Printed on simple cotton, the blurred lettering and minute detail gives the impression that an Angeleno, upon being asked by a tourist what to see and do, stopped for moment, whipped out his handkerchief, and began a flurry of sketching in an effort to capture all the hot spots and landmarks. 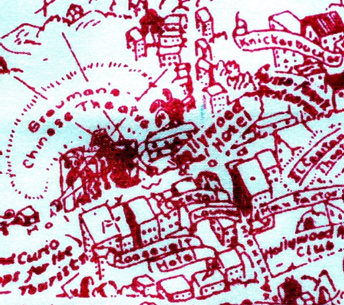 You’ll note that Hollywood itself is quite small and manageable when removed from the overall sprawl of Los Angeles. 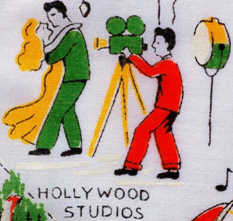 I have no idea who the bride and groom are; they’re not identified, but we’re well aware that star marriages seem to happen weekly in tinsel town. Is that Cecil B. 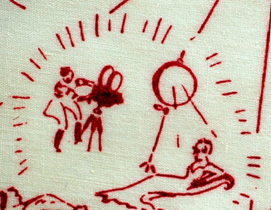 De Mille in riding boots filming a starlet reclining on the divan? 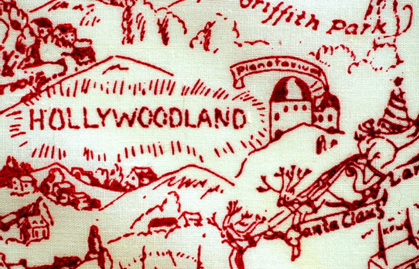 The sign reads Hollywoodland,confirming this handkerchief is pre-1949. Is that Santa’s sleigh in the corner? Indeed. 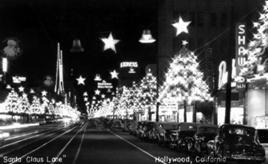 Starting in 1928, right after Thanksgiving, merchants would turn a one mile stretch of Hollywood Blvd. into Santa Claus Lane to boost holiday shopping. 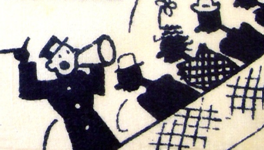 A daily parade featured Santa and a film star. 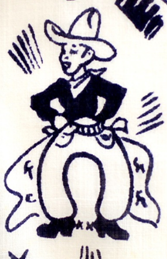 When Gene Autrey rode his horse in the parade in in 1946, he was inspired to write the song Here Comes Santa Claus…right down Santa Claus Lane. Check out those cars! Parade Grand Marshalls have included Charleton Heston, Bob Hope, Jimmy Stewart, Roy Rogers and Dale Evans, Mickey Rooney, William Shatner, even Mickey and Minnie Mouse.Speaking of which…..
Mickey Mouse was so popular he’s included here, though the Disney studios were in Burbank. 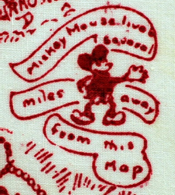 The hankie indicates that Mickey lives a few miles away from Hollywood. 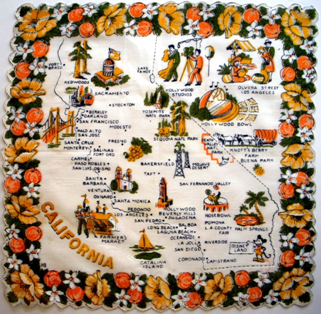 There is no mention of Disneyland as it wasn’t dedicated until 1955. Here are two more handcrafted beauties. The reason I think perhaps these were homemade and not factory produced is the lack of consistency. I never thought of Mickey as a fashion plate, yet every day his shoes, gloves and shirt are a different color. And what’s with the orange tail? 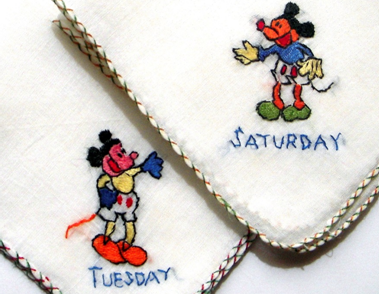 I think granny stitched Mickey with whatever was on hand. The detail is divine, right down to the dual color criss-cross hems, don’t you think? I’m always surprised (and gratified) to see such care taken to make the simplest everyday item a delight to own and carry. 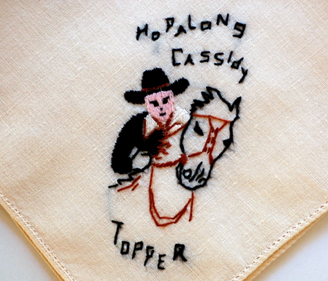 It certainly conveys the message a child deserves as much respect as an adult, right down to his embroidered hankie. Famous restaurants and clubs were as plentiful as the stars who frequented them, making celebrity watching a popular pastime. 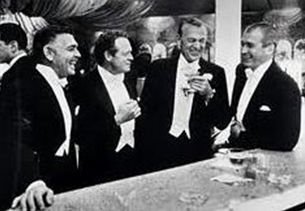 Pictured here are Clark Gable, Van Heflin, Gary Cooper and James Stewart gathering at Romanoff’s for a 1957 New Year’s Eve party in the Crown Room. Smithsonian magazine deemed this picture “a Mount Rushmore of stardom.” White tie and tails for the men, and satin, diamonds and furs for the ladies were de rigueur for the Hollywood elite. 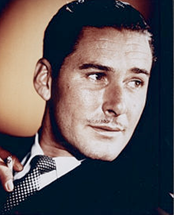 Because no good actor exits stage left without leaving the audience with a pithy saying, a saucy tidbit, or perhaps a chuckle, I’ll close with an anecdote that is certainly Hollywood, but took place on Catalina Island, at Avalon Bay to be exact. When my mother was a young working girl, she and some girlfriends had a very special overnight excursion to Catalina Island to dance at the Avalon Ballroom. My mother was a swimmer and a diver, so while everyone else slept in on Sunday, she arose before dawn to go for a swim. Afterwards, while resting on shore with her eyes closed, she heard splashing. 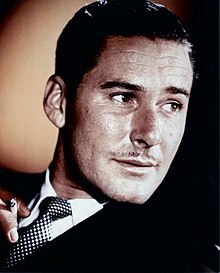 When she opened her eyes, there, in here words, “arising from the ocean like Adonis at daybreak” – tan, sleek, and shimmering, was movie heartthrob Errol Flynn. (think George Clooney charisma combined with Warren Beatty’s roving eye) He looked straight at her, flashed a dazzling smile and said hello. She was so taken aback she couldn’t speak or even nod. She just stared. When she told her girlfriends what happened, they said Flynn was still at the ballroom until it closed. They surmised he never had time to retire; he just changed clothes and took an early dip to wake up, and perhaps begin partying all over again. Ah, Hollywood…….